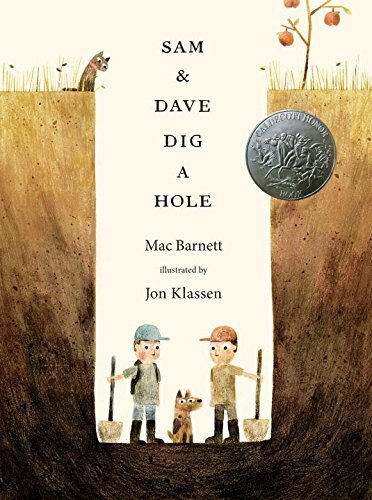 There are certain characteristics I really love in children's books, and Sam and Dave Dig a Hole by Mac Barnett and Jon Klassen checks all the boxes. The story is pretty straight forward. Two boys, doing what boys have been doing for millennia- digging a hole. Add in a search for something spectacular and Mac Barnett's knack for big imagination and just the right amount of quirk, and this hole-digging expedition turns magical. Masterful illustrator Jon Klassen encourages imagination and of course makes everyone laugh through illustrations that are as important in telling the story as the words. The biggest indicator to me that this book is something special is that everytime I read it to my kids they want to go outside and dig a hole. And just like Same and Dave, they've never dug up any item of great value, but they have found their imaginations and experienced the simple joys of childhood. In my book that's pretty spectacular. I shared this video I made on Instagram at the invitation of my friend Teri to join her in a month of #bookishplay ideas. Join Teri, myself, and a whole bunch of other very talented and imaginative ladies every Friday in May to see what books we're reading to our kids and how they're inspiring our kids to play. As always, I'd love to hear your thoughts! And if you enjoyed this, it would make my day if you shared it!